=========================================== V The Second Elimination Final takes place at Suncorp Stadium on Saturday Night when the Brisbane Broncos host the St.George-Illawarra Dragons in Game 6 of the 2009 NRL Finals Series. 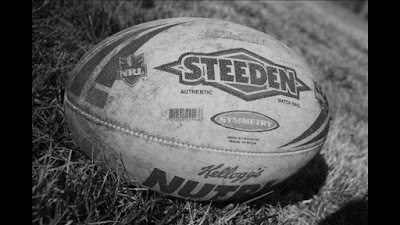 Just two games are due to be played in Week Two of the 2009 NRL Finals Series, but both promise to be absolute beauties. Heading into the Second Elimination Final, Brisbane earned the right to host the game by knocking off the 3rd Seeded Titans in their Qualifying Final but have drawn the 1st Seeded Dragons - who lost to the Eels. The match up isn't ideal when you win your first semi final and then get to play the Minor Premiers but that's the way the McIntyre System works... and David Gallop is in love with it so it's not going to change anytime soon. Brisbane were very good in the opening half against the Titans - racing to a 28-10 halftime lead but defence has been an issue for the Broncos all year and they allowed the Titans to draw perilously close towards the back end of the game before winning 40-32. The Dragons couldn't capitalise on 15 minutes camped on the Parramatta tryline to open their Qualifying Final and paid the price for only having a 2-0 lead from it. The Eels laid on two quick tries before the Dragons knew what was happening and they never saw the lead again. St.George-Illawarra like to rely on their defence and opportunism in attack to win games, while the Broncos rely on their plethora of attacking weapons to blow teams off the park. It should be a cracker on Saturday Night at Suncorp. In team & injury news - BRI - Despite some general soreness across the board the Broncos should play the game with the 17 named on Tuesday. STI - The only decision that Wayne Bennett seems to have is whether to carry Jason Nightingale on his bench once more or go with an extra forward in Jarrod Saffy. There are no injury concerns for the Dragons. Here is the Video Preview for the Broncos v Dragons with Warrick Nicolson & Nic McInerney Thursday 17 September 2009. ================================================================================== V EF2: SATURDAY NIGHT @ Suncorp Stadium 8:00pm - Referees: Tony Archer & Ben Cummins; Sideline Officials: Paul Holland & Jeff Younis; Video Referee: Paul Simpkins; (Standby Referee: Jason Robinson), (Standby Sideline Official: David Abood) #6 BRISBANE BRONCOS v #1 ST.GEORGE-ILLAWARRA DRAGONS BRI: Hunt, Winterstein, Folau, Hodges, Yow Yeh, Lockyer (c), Wallace, Kenny, McCullough, Taylor, Sims, Thaiday, Parker. Reserves: Setu, Clinton, Carroll, Glenn. STI: Boyd, Morris, Scott, Cooper, Sailor, Soward, Hornby (c), Poore, Young, Weyman, Prior, Creagh, Smith. Reserves: Hunt, Costigan, Fien, Nightingale, Saffy (one to be omitted). NSC PREDICTION: DRAGONS 21 def. BRONCOS 20 MAN OF THE MATCH: Jamie Soward, Dragons FIRST TRYSCORER: Wendell Sailor, Dragons The 1st Elimination Final is on Friday Night with the Eels taking on the Titans. ================================================================================== Next Week (Finals Week Three) - The Preliminary Finals PF1: Friday 25 September @ ANZ Stadium, Sydney v WINNER of V PF2: Saturday 26 September @ Etihad Stadium, Melbourne v WINNER of V ELIMINATED TEAMS: Finals Week One: The best way to follow the 2009 Finals Series is to go to NRL_Finals_2009 on Twitter. During the first week of operation, we produced 250+ Tweets - with some great nuggets of information in there, as well as news as it breaks. For the games themselves, regular Tweets will be uploaded giving you an instant evaluation of how the game is being played out and what to watch out for during the match. You can check out the In-Game Tweets within the Game Reports from all four Qualifying Finals - just click on the linked articles on the drop down archive menu on the right of this page. So subscribe today and get involved with feedback - either here at wdnicolson.blogspot.com, at NRL_Finals_2009 on Twitter or via email wdnicolson@optusnet.com.au. Get on board and may the best team emerge from a great month of football to take the 2009 premiership.